Chili Jam for sale. Buy online at Zingerman's Mail Order. Gourmet Gifts. Food Gifts. 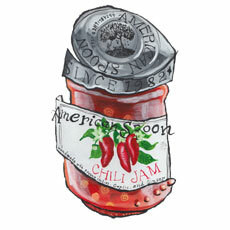 American Spoon’s master jam makers create this sensually sassy spread from Fresno chilies grown by Dave Coveyou on his farm overlooking Walloon Lake in northern Michigan. Hot, spicy, smoky and just a tad sweet, I can see why this jam may seem intimidating, but you’ll wanna step up to this plate. Along the lines of a sriracha, but thicker and a touch more complex. It’s great atop grilled meats like pork tenderloin or even on a burger. Mix a dollop with mayo for a spicy vegetable dip or your own house sauce for finishing rice bowls. Or crab cakes. Or french fries.